If you haven’t heard of The Flower Shuttle, you might be pleased to know that there is a wonderful organization out there that recycles flowers otherwise destined for the dumpster by re-fashioning them into sweet little bouquets and giving them away to those less fortunate. That’s what the over 100 volunteers of The Flower Shuttle do in order to bring a little beauty into the life of someone who could use it. And they have fun doing it, too! The weekly arranging sessions seem more like friends gathered for fun conversation combined with a flower-arranging marathon. Laughter and chatter ring out in the big hall at the Raleigh Moravian Church where the bouquet assembly takes place. 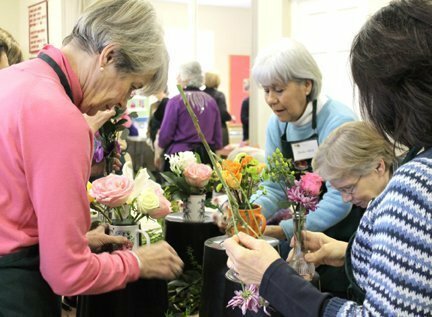 Volunteers go to and from the fragrant riot of flowers stretching down a long central table, carefully selecting from a rainbow of colors for their arrangements. How did Flower Shuttle get its start? In February of 2006, a local artist read an article in Oprah magazine about a flower recycling and donation program in New York. She brought her idea to her church, Raleigh Moravian Church, which agreed to support the program as a community outreach project and provided seed money to get it going. There are many hands that bring this process to life. Flowers are collected from florists, flower wholesalers, grocery store floral sections, funeral homes, community events, weddings, and even local gardens. Vases and mugs, previously collected, cleaned, and stored, are filled with water and set on the tables. Flower arranging stations are set up. Completed arrangements are boxed up for delivery and the bouquets are delivered to their destinations. Then, there’s the clean up! Since 2006, The Flower Shuttle has donated tens of thousands of bouquets to over 30 organizations in the Raleigh area including Hospice of Wake County, Duke Children’s Hospital, North Carolina Cancer Center, Wake Assisted Living, Meals on Wheels, and several nursing homes. It’s more than just a fleeting gift of beauty for those receiving a bouquet. These little floral missives convey love. Here’s a little love for you, the bouquets say. We don’t know you but you are thought of in your time of trouble, illness or loneliness. Here is something beautiful to help you remember you are not forgotten. To learn more about volunteering or donating to The Flower Shuttle, visit www.theflowershuttle.com.